Hey! Cheers Alex Cavanaugh and a special warm greeting to his amazing wife, who I am sure about now has ducked around a corner somewhere, even though she must be extremely proud of Alex, she is just as much of an enigma as her husband.Thanks Ms. Cav for sharing him with us! So…In case you peeps have not guessed by now this is the “Cheers to you Alex Cavanagh” a SUPER spaced out Blog party hosted by Mark Koopman, Morgan Shamy, Stephen Tremp, and David Powers King! There are a lot of rules for winning prizes at this awesome party, so I will do my best to follow them, if you want to check them out for yourself then LOOK HERE. I am just here for the free food and drinks, however I do admire Alex the "Ninja" blogger…Why, you ask? Probably for the same reasons everyone does... he is a helpful and time giving blogger friend, blah blah, etc...etc...but seriously, he always knows the five "W's"and the one H so if I were to guess, Alex is much like our friend with a beard that has found a way to time travel. Think about it, how does he get around to everyone? 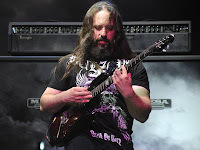 My guess is he looks just like Santa too…I would cast Santa as Alex in any future documentary but since he is always fully booked, I would have to go with John Petrucci. You could say I was surprised when Cavanaugh came into my café with his famous Cosbolt worn guitar slung over his shoulder and asked for a piece of my chocolate cake. He flashed me pearly whites from under his big beard and said, “A jug of milk to go would be nice.” Before I managed to get his autograph, he disappeared with the speed of a Ninja. The sound of his music hung in the air, and from the window I saw him fly away with “IWSG ON TOUR” written on the side of his magic sleigh. Merry Christmas Mr. and Mrs Claus! Have a great week everyone and don't forget to check out this great party by clicking the link on my sidebar! I hope I left you a tip! That was wonderful, Siv. Now if only I had the talent of Petrucci. Thanks so much for being such a great friend. OMGosh definitely loved the posting! What a very nice tribute! I am still laughing at Let Him Eat Cake. Enjoyed reading your post. I'd like a slice of cake and milk, too! Really fun to read. Alex as Santa, huh? And twice he's thought of that way. Santa may leave Alex a lump of coal in his stocking! LOL. Love the comparison to Santa Claus - perfect!!! Haha, adorable post. I can't believe we've finally figured out who Santa Claus is!!! Santa Alex! I love how Santa is a heavy metal guitar player. My nephews would die. LOL! Great piece and an epic interpretation of our Captain. I love the Alex is Santa idea. He has to have some kind of magic to get around to all of us! I'll take a piece of cake too. Of course he has a magic sleigh! Wonderful! 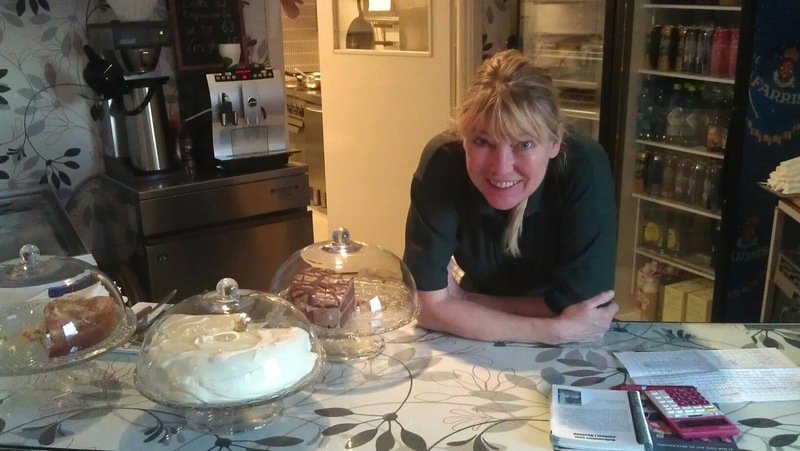 Your cafe sounds fun, Siv can I visit? I agree Alex for Santa! Cake is a good conversation starter. Liked the story, and the Santa angle. Hehehe! That was so much fun! Alex is a bit magical. LOVE the pic in your cafe' Sis. Nice and magical tribute to our blogger buddy. Well done. Hi Siv .. love the cake thought - and I'd join you in that cafe anytime .. and would definitely make a point of being there if Alex was dropping in ..
that was a fun story! and yummy! i want cake! You could name a dish or sandwich after Alex. Like some delis name a meal after a celebrity. Like the Alex Pastromi Sandwich Special. Excellent and original! Too funny.